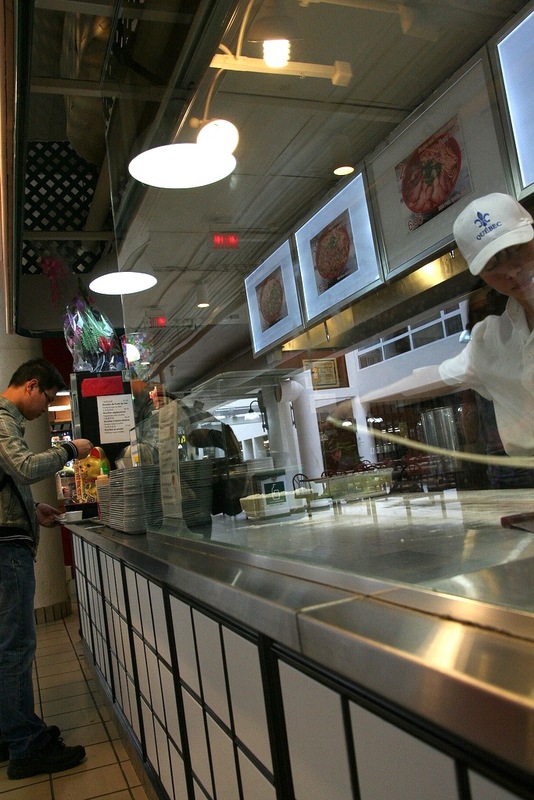 I stumbled onto Yuki Ramen on a blustery, noodle-needing day, many months ago, wandering through the culinary wonderland that is the Concordia ghetto. What’s astonishing about the Fabourg building is how spare yet nourishing it is – probably the best “food court” in the city, if it is indeed possible to call it such, when really it might be called a “noshing plaza”. And what to nosh? Ramen of course! At the time I hadn’t even tried ramen yet, not the real stuff. Not the unboxed unbagged qualifiable japanese true Thing, but that was about to change. 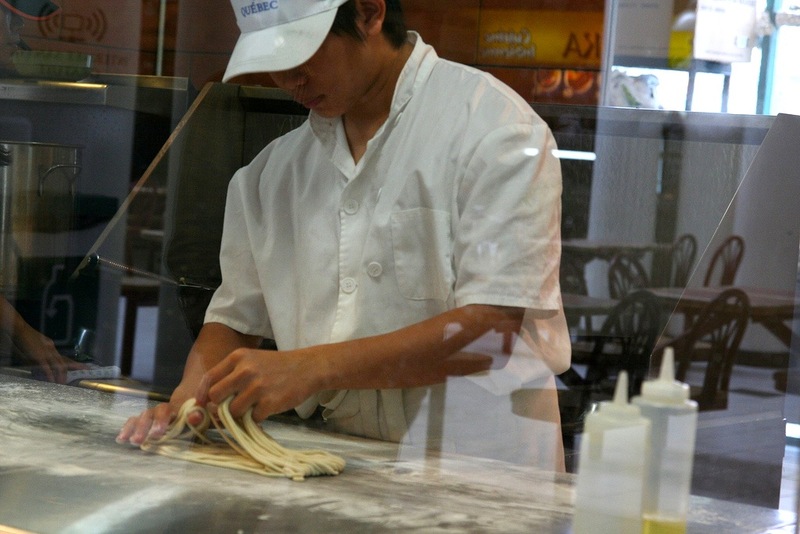 I mean, when you see someone hand-pulling noodles from a sproingy stretch of dough as long as an armspan, mesmerizingly growing and shrinking and doubling over in the hands of the puller expert… there isn’t much else that looks so delicious! I ordered forthwith. Well, with a short spell to take out money from a nearby ATM, that is. (they only take cash). I ordered the BBQ Pork Ramen, a neat 7$ (about, I don’t imagine it was more than 8$), and awaited my order’s completion. It took about 5 minutes of absorbing the atmosphere of happy soup-slurpers and then my lunch was ready. Oho! It was in pieces! The way they deliver it is with the chunkies in the main bowl and piping hot broth on the side, that cooks everything fully once you throw it on and everything melts together. A bit of a stir and an add-in of the nice dark sauce (vinegar of some kind? it’s been a while) and the umami treat was ready to eat. And oh those noodles! Exactly as awesome as fresh noodles should be – strong but yielding, tasting intensely of soft clean wheat, plentiful and warming and fun to slurp. The pickled WhateverVeg they added on the side deserves mention, too. Delicious! Refreshing and sharp and not too salty at all, I wish I knew how they made that. The pork, alas, was mere pork with a kiss of BBQ red rimmed taste, and the broth of the ramen itself was not going to set any records for perfection, but it was slightly sweet in a good way and did the trick as a steaming home for those wonderful noooooooooodles. I left warmed from the inside and the outside grey was not so grey at all anymore, belly sloshing with hot sauce and herbs. Perfect. Basi Italian Bistro – stylish ungroundbreaking italian, but take a date there, seriously. Good review. 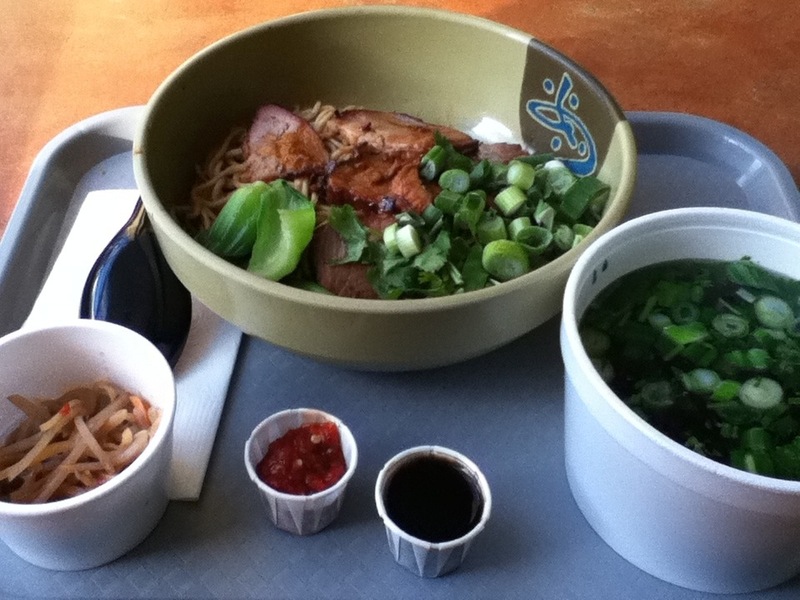 I had the same experience with the BBQ pork noodle bowl, really liked it. Went back again and tried the pork sauce one (#6) and was not as impressed. I think I’ll stick to the BBQ pork on future visits.